This is one of my favorite fall centers! It's simple and really helps the kids with counting numbers using a 10 frame! I bought the little pumpkins from the dollar bin at Target, and printed off these Fall 10 Frame Mats. When the kids are finished with their work, they can grab some pumpkins and a mat, and practice counting! I also put some little erasers at the math counting center for the students to use as counters. These erasers are also good for making patterns! Once the students understand the concept of the 10 frame, then I introduce the 20 frame to them! 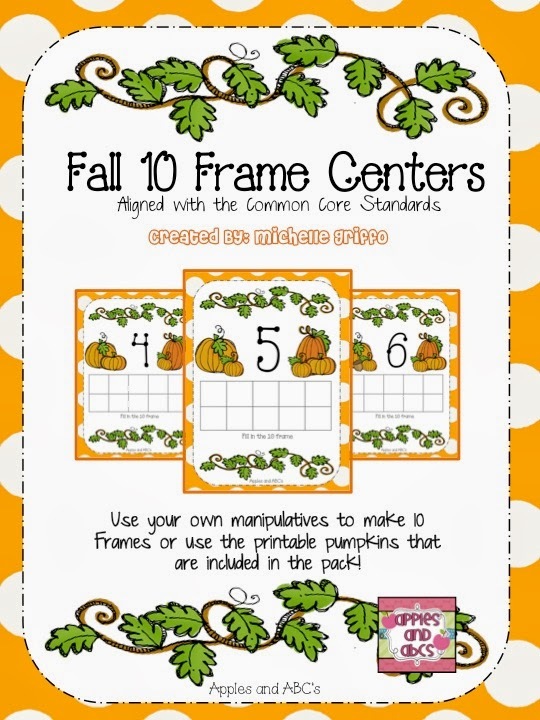 These Thanksgiving 10 Frame Mats work well for the kids that are ready to be counting beyond 10. The little leaves are also from Target. They are great to use during the fall as a counting manipulative! I totally bought all those little pumpkins and leaves from the dollar section, too! The minute I saw them, my mind was racing with all the classroom possibilities! I love these ten frames, though. Great idea!